I'd like to take a moment to share a bit about myself so that you can feel comfortable hiring me as your photographer. For starters, I am a happily married lady married to my best friend as of November 2017, mom to 2 daughters and an awesome new son, a lover of animals and nature, passionate about my faith, friends, family and the life we've been blessed to share. I am excited to be living my dream as a photographer capturing wonderful moments in the lives of my clients as well as beautiful properties within the unmatched charm and beauty of Gatlinburg, Pigeon Forge, Sevierville and the Smoky Mountains of East Tennessee. I am passionate about photography and capturing the world around me is one of my greatest joys in life. I believe this love shines through in sessions and in my work from start to finish. I take my responsibility as your photographer very seriously and I will work hard to give you the tangible photographic memories you dream of. I have been told that my photo sessions are friendly and casual, yet professional and will put your family, children, or pets at ease. Whether you are vacationing in the Smokies, planning your dream wedding, popping "the question", expecting a bundle of joy, documenting the milestones of your little ones, celebrating a graduating senior or wanting to capture that perfect shot of your furry best friend, or needing outstanding photographs of your rental property, I thank you for giving me the opportunity to work with you in creating that perfect, tangible memory to hang on your wall. Last but not least; we want to give a "shout out" to the one who made all of this possible. He gave me the gift and talent of capturing the world around me with a camera. 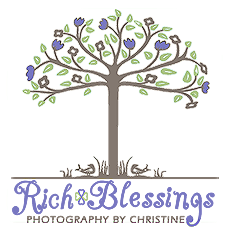 Rich Blessings Photography is dedicated to honoring Jesus Christ, for without Him, none of this would be possible.